Emergency vehicles at the Quality Inn in Lyndhurst, N.J.
RUTHERFORD, N.J. — The FBI says suspicious materials discovered in packages delivered Friday to multiple hotels and a deli located less than a mile from MetLife Stadium in New Jersey and to former New York Mayor Rudy Giuliani’s office in Manhattan appear to be harmless. Giuliani told FOX Sports 1 that the package his office near Rockefeller Center received contained "a non-toxic substance," but that further tests were being done "just to be sure." "The building is now operating perfectly normally,” Giuliani said. A police source told FOX Sports 1 NFL Insider Mike Garafolo that as many as 10 locations are being investigated, and that the packages are believed to have originated in the southern United States. The source also told Garafolo that one of the substances was identified as cornstarch. A federal law enforcement official told The Associated Press that powder from one envelope tested positive for baking soda. "The Joint Terrorism Task Force and Hazard Materials units have responded to several locations that have received a suspicious letter and substance. There are no reported injuries at this time, and the locations are being secured." Several hours later, the FBI in New York tweeted, "Substances in suspicious letters in New York and New Jersey deemed non hazardous. Additional testing to come." "It was nonsense," he said. Lyndhurst Police Captain James O’Connor says he was investigating a "suspicious envelope" at the Courtyard Lyndhurst Meadowlands near MetLife Stadium, site of Sunday’s Super Bowl between the Seattle Seahawks and Denver Broncos. People were coming and going from the Courtyard, including Giants wide receiver Victor Cruz, who Garafolo says "had no idea that anything was going on." The nearby Renaissance Meadowlands Hotel was evacuated for the investigation, Garafolo says. Carlstadt Police Det. 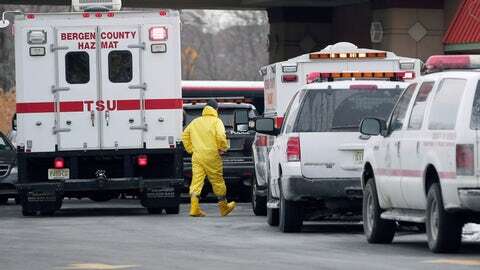 John Cleary told The Associated Press that someone at an Econo Lodge found a substance in an envelope on Friday. Cleary says similar mailings arrived at the Homestead Inn in East Rutherford. He says investigators intercepted additional envelopes from a mail truck before it reached a Holiday Inn Express and Hampton Inn in Carlstadt. Hackensack University Medical Center received a number of people for evaluation because they came in contact with the letters, but a hospital spokeswoman says there are no reported illnesses or injuries, according to The Associated Press. The NFL is aware of the situation and has deferred to the authorities, Garafolo says. Watch live updates on this developing news story on FOX Sports 1. Follow Mike Garafolo on Twitter @MikeGarafolo.